This cake is for Courtney’s friend Sierra’s boyfriend’s birthday! 🙂 The cake is a yummy vanilla from the White Almond Sour Cream cake recipe but with no almond flavoring and the frosting is our favorite buttercream. The black fondant is Duff’s from Michaels and the white is Pettinice from Funfinity. 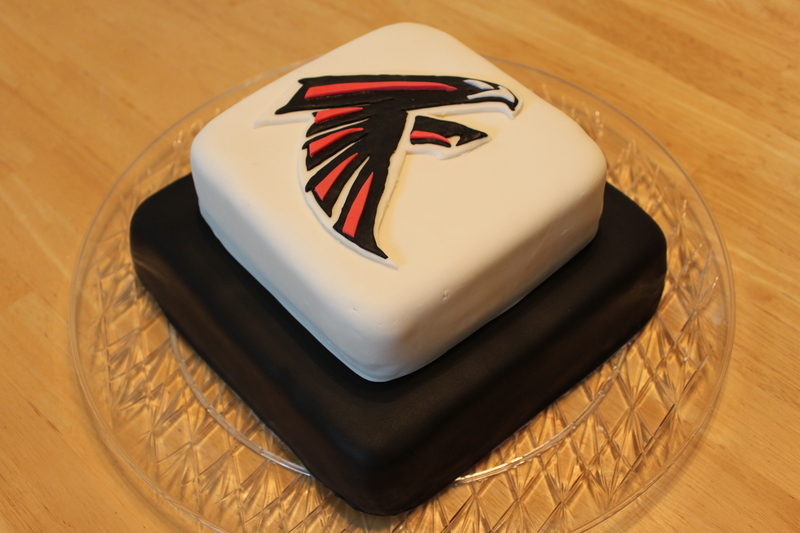 The sports themed cakes stretch us a bit but Courtney stepped up and cut out the falcons logo freehand; she is awesome! So Happy Birthday to Sierra’s boyfriend! The falcon logo is so well crafted! Thank you so much but I cannot take credit for that, my daughter does all the detail work and does such a great job. I will pass on your compliment to her, thanks again!